IT'S EVEN WORSE THAN WE THOUGHT! OUR ELECTIONS IN THE U.S. ARE ESSENTIALLY RANDOM EVENTS, CONTROLLED BY OUR THREE-STOOGE ELECTION SYSTEM. People are mystified by the outcomes of our elections in the U.S. Many people think that either many voters are totally stupid or that the elections are either bought or rigged. Some even have suggested that the election machine manufactures are somehow fixing the elections so the candidates those companies want to win are favored. It's even worse. The very system we trust to elect our politicians is defective. So instead of having fair elections, we have an election system that acts like The Three Stooges are in charge of the process. In fact, there are three "stooges" that are turning our elections into a huge tangled mess of unexpected results. Voters: non-PVS systems "too complicated"
Users: non-PVS systems "too complicated"
Slanting to make liberal plans look good. Making impossible liberal plans look plausible. The Democrats had one candidate (Obama). The Republicans had more than eight. The faulty Plurality Voting System knocked out all of the mainstream Republican candidates early in the primaries, leaving only oddballs Mitt Romney and Ron Paul. The liberal press heavily favored Mitt Romney because he had created a health care program similar to Obamacare. Reporters on contract strongly want Obamacare for themselves. The press heavily slanted the news coverage, using lies and innuendo to say that the Republican Candidates would discriminate against minorities, cut programs for the poor, make the economy worse, and cause more wars. Another Republican won the Libertarian Party nomination for president. When two Republican candidates for Congress, each in different timed debates, uttered sentences that could be understood two different ways, the press deliberately reported the wrong interpretations, even though the candidates clarified their remarks a few seconds later. In both cases, the wrong interpretation said that the Republican candidates said that some rapes were not crimes or were sanctioned by God. This is the ultimate in malfeasance by the press. The polls predicted a Romney win. The faulty Plurality Voting System split the Republican vote between a Republican candidate that most Republicans didn't want and another Republican running on the Libertarian ticket. So the worst Republican won the Plurality Voting primaries to get the party nomination, and then Plurality Voting and the liberal press elected Obama by biasing the election. Both times Bill Clinton won the election for president (1992 and 1996), Ross Perot unwittingly used the Plurality Voting System to give Clinton an unfair advantage. In 2004, Democrats used exit polls to claim that Democrats should have won several Ohio races, including president. The voluntary nature of the polls, differences between poll and election methods, and mostly inner city poll collection combined to make the poll results differ from the election results. The media agreed with the Democrats because most reporters want Democrats elected. In 1982, polls showed that Democrat Tom Bradley would win the election for California governor, but Republican George Deukmejian beat him by almost 100000 votes. Bradley called it the "Bradley Effect", saying that people falsely reported how they would vote to the polls. The true cause of this election outcome was the faulty Plurality Voting System. Two liberal minor party candidates got more than 120000 votes. That is enough to change the outcome of the election. If those minor candidates had not run, Bradley probably would have won. Enough voters voted for Ralph Nader instead of Al Gore to cause Gore to lose the states of Florida and New Hampshire. This gave George Bush enough electoral votes to win the election. The defects in the punch cards were caused by unmaintained card readers. The irony is that the card readers were not maintained because Al Gore wrote the bill that banned the Freon cleaner needed to remove the card dust. No other cleaner works. The press was treating Gore's beliefs about the punch cards as being true, probably because the reporters wanted Gore's socialized medicine for themselves. Gore tried to get the Florida Supreme Court to modify Florida law to let him win by counting disqualified absentee ballots. The Florida court made the change, but the US Supreme Court struck down the Florida court ruling. The press wrongly accused the US Supreme Court of "unfairly deciding the election. They probably did this to get socialized medicine for themselves. Gore tried to get Florida to disqualify all absentee votes from military servicemen serving aboard ships. His reasoning was that the ballots were not postmarked, as Florida law requires. Florida denied him, because NO military mail coming from ships is ever postmarked. Here we see the Three-Stooge Election System messing up at its finest. All three of the main effects were working hard to trash the election results. This measures public opinion. But public opinion is not a totally deterministic measure of the outcome of an election. It wrongly assumes that each person favors only one candidate. These are Plurality voting results, which are affected by the similarity and uniqueness of candidates. Public opinion does not indicate these factors. Plurality results do not give the entire picture of who people want. If ranking is used. It is a very poor indicator of anything. Plurality voting results are affected by the similarity and uniqueness of candidates. Public opinion does not indicate these factors. Plurality Voting methods are used, but the candidate list is different. Averaging multiple polls with different sample sizes causes errors. Using linear regression to find trend lines of opinion. This assumes that public opinion behaves like a large mass with inertia. It fails if some sudden event or revelation drastically changes public opinion. Plurality Voting results are only partially based on trends. The Fox News "Power Index" ranks candidates using various reasons voters like and dislike the various candidates. Ranking is a very poor indicator of anything. Plurality Voting results are only partially based on likes and dislikes. Plurality voting results are affected by the similarity and uniqueness of candidates. Plurality Voting results are based more on the inverse of the number of similar candidates, rather than popularity. The Washington Post "Faction Method" ranks candidates in each of several factions, and also ranks the factions according to popularity. Plurality Voting results are based more on the inverse of faction size, rather than faction popularity. Plurality voting results are affected by the similarity and uniqueness of candidates. Public opinion does not indicate these factors. Searches are a form of Plurality voting. Some of those searches may be politicos digging up dirt on the competition. The sampling method used may be biased by the wording of the search. This measures giving, not public opinion. Many voters totally disregard (or even laugh at) political ads. They have already made up their minds. Some of the political ads totally enrage many voters. The Plurality Voting System defects will have a much greater effect on the outcome of the election than any political contributions will have. Measuring the unemployment and per-capita income. Failed to predict Obama 2012 win. Plurality voting results are affected by the similarity and uniqueness of candidates. Personal suffering may not overcome these problems. Online betting on the outcome of the election. Betting may depend on trying to win money, rather than the election outcome. Plurality voting results are affected by the similarity and uniqueness of candidates. Gambling effects may not reflect these problems. John Antonakis and Olaf Dalgas at the University of Lausanne in Switzerland showed only the pictures of the candidates to children and adults, and they predicted most of the results based on only how good the candidates look. Unfortunately, too many voters, especially women, let the looks of the candidate sway their choices. It is a bias that a candidate cannot do much about. Could this be why people choose such awful candidates? If so, Maybe they should not let us see the images of the candidates, or prohibit using styled hair. Because of the effects of the Plurality Voting System, this is still not a decisive factor. This assumes that Democrats have had so many states' electoral votes since 1992 that they need only 28 electoral votes - Florida's - to win. They are assuming that most people have not been totally upset by President Obama's actions and Hilary Clinton's crimes. The story is that, if the Redskins win the last home game, the party in power gets to keep the White House. If they lose, the other party takes over. This is an independent event that has no bearing on the election. The story is that sales of the masks of the winning candidate are higher than the sales of the masks of the losing candidates. This assumes that the people who buy the masks like the candidate. But some people buy masks of the candidates they hate to scare people or ridicule the candidates. This measures public opinion. Public opinion is not a totally deterministic measure of the outcome of an election. A pretend election used to teach how voting works has the same outcome as the later real election. This assumes that the children reflect their parents' politics. Since plurality voting is used in both the mock election and the real election, the results could be very similar. The cup the coffee drinker chooses is his vote. This assumes that the purchases reflect their politics. Some people just grab the cup without looking. They want the coffee! This gives no advance prediction, but it has matched the result of every Presidential election since 1956. Excepting one year, every time the Summer Olympics were held in a country that has hosted them before, the incumbent party won the election. The one year that this missed was 1968. But it does not apply before the first time the Olympics repeated a hosting country. Since the 1970s, if a downbeat picture (bad guy wins, good loses) won the Best Picture Oscar, the White House switched parties. If an upbeat picture won the Oscar, the party in control retained the White House. The mood of the country might influence which picture wins the award. But because Bush won the 2000 election due to an effect of the faulty Plurality Voting System, such an influence would have been in the wrong direction. This is probably an independent event that has no bearing on the election. Astrology is totally independent to the election. Plurality voting results are affected by the similarity and uniqueness of candidates. Astrology can have no effect on this. If Lakers are in the final, Republicans win white house. Sports are totally independent to the election. If the American League wins, Republicans win the White House. If National League Wins, Democrats win. The choices (candidates) are A, B, C, and D.
PVS looks at only the first place vote of each voter. All other preferences of the voters are ignored. PVS is biased, as seen at left. People like PVS because it is easy, because it is less work, or because it's the only way they know. None of these justify using PVS. The results are still wrong. Voter ranks n choices from 1 to n; each vote is n-r+1 for rank r.
Can't take equal rankings. Can't tell which choices voter dislikes. Voter ranks n choices from 1 to n. Pairs of rankings are tested for who wins. Choice score is number of pairs won. Can't take equal rankings. Can't tell which choices voter dislikes. Treats small and large differences same. Can produce no winner. Voter ranks n choices from 1 to n.
Do while no majority: Remove choice with fewest #1 ranks. Fill voids by moving ranks up. Larger vote can make choice lose. Can't take equal rankings. Can't tell which choices voter dislikes. Treats small and large differences same. PWE favored because it gives immediate result. PWE should never be used. Four different ranking voting systems shown above produce four different winners! This means that ranking is not a valid method of election. It must be abolished. Each voter rates choices on scale from 0 to 9. Sum the ratings. Highest score wins. Races may be awfully close. Ties are likely. The margins of 1.63 % and 0.77 % might trigger demands for recounts. Each voter votes for all choices he likes. Here, a vote an at-large set of 3 ranked choices. Some voters cast more votes than others. Some voters have more power than others. Favors centrist choices. Gives wrong results with at-large elections. Ties are common. Each voter votes independently on each choice. Each choice score is YES votes minus NO votes. Actual voter behavior is somewhere between above two cases. Voter intent is preserved with IVS. The following table compares how pleased the voters are with the results of each of the voting systems. At-large voting is discouraged because it is a means to multiply power. Note: Here, Max Worst occurs here with choice A or choice D win. split - Vote splitting occurs among similar choices. liked - Can't tell if voter likes or dislikes choices. unwon - Some election outcomes have no winner. ditonic - Increasing votes for A can reduce A's chances. close - Most elections will have very close outcomes. ties - Many outcomes will be ties or very close. Independent Voting is the clear winner, producing a better result than other systems. It always chooses the choice that pleases the most people. It works because it does NOT use ranking. One of the indicators of a faulty voting system is the lack of balance between the YES votes and the NO votes. Voting systems with balance work the best. If the voter can set his own balance and numbers of YES and NO votes, the system is optimum. Win margin - number of vote changes needed to change outcome. Again, the Independent Voting System (IVS) is much better than the others. They put stories about the candidates they like first on the newscast. They use happy tones of voice to describe liberals, and somber tones of voice to describe conservatives. They report every event they can find that shows bad things about conservative candidates. Often reporters deliberately misread what a conservative candidate said or did and report the misreading as fact. In the two cases in 2012 listed above, reporters used the fact that two conservative candidates used poor choices of words with multiple possible meanings to report falsely about those candidates. Just before the election, with no opportunity for the accused candidate to check out the allegation and report the truth, reporters report half truths about conservative candidates to discredit them. Then they sometimes print a "correction" the day after the election. In 2004, reporters dug up the fact that George W Bush had been arrested for drunk driving. After the election, it is revealed that this happened while Bush was in college. In the 1990s, a local contractor in the page author's area was attacked by reporters in two different elections. The first time, he was accused of tearing down a "historic wall" (the wall was not historic except in the mind of the reporter). A conservative candidate for Congress was accused of not having paid a speeding ticket in another state (he had paid the ticket, but a liberal in the Bureau of Motor Vehicles intercepted and hid the report from the other state that the ticket had been paid, then tipped off the reporter). A Republican candidate was accused of using a push poll to trick voters into voting for him (investigation showed the Democrats paid for it, telling them to be obnoxious enough to turn off his voters). Democrats did this to him after he exposed how the Democrats secretly changed the zoning maps without a vote to move the mayor's house he was selling from a single-family zone into a multi-family rental zone. The following measures will fix these defects in the way we elect our officials. Replace the Plurality Voting System with the Independent Voting System. The plurality Voting System has been shown to be defective. It must be replaced with a system that has no biases. Replace the Electoral Voting System with the Independent Electoral Vote System. The plurality Voting System has been shown to be defective, as is a "winner-take-all" electoral vote system. It must be replaced with a fair system that has no biases. The state winner taking the entire state is wrong. Either have one district for each elector, or use the congressional districts, and have two at-large electors vote for the overall state winner. Require polling companies to use the Independent Voting System for their polls. Prohibit the press from taking sides in elections. Journalism is defined as neutral reporting of the facts. The press is taking sides for the personal gain of the reporters. This is a conflict of interest, and must be abolished permanently. Any member of the press who takes sides in an election should be charged with using his position for electioneering. Any reporter who purposely lies or distorts the truth about a candidate to affect the outcome of an election should be charged with electioneering and false informing. Require bills for major changes in the law to face referendum votes. This reduces single-issue voting in the candidate election. Of course, these elections must use the Independent Voting System. There are 100000 voters (to make the math easy). 30% of the voters (30000) are Republican. 40% of the voters (40000) are Democrat. The remaining 30% (30000) are Independent. Most of the voters will base their vote on Proposition X. 18000 Republicans favor Proposition X. 12000 Republicans oppose Proposition X. 24000 Democrats favor Proposition X. 16000 Democrats oppose Proposition X. 16000 Independents favor Proposition X. 14000 Independents oppose Proposition X. Candidate A is a Republican who favors Proposition X. Candidate B is a Republican who favors Proposition X. Candidate C is a Republican who opposes Proposition X. Candidate D is a Democrat who favors Proposition X. Candidate E is a Democrat who favors Proposition X. Candidate F is a Democrat who opposes Proposition X. Candidate G is an Independent who opposes Proposition X. If a choice exists between multiple similar candidates, the voter chooses randomly among them. Because no Independent candidate is running in the primary, each independent voter will choose the Republican party for the primary and a candidate matching his Proposition X opinion in the general. After the primary, Independent Candidate G opposing Proposition X runs as a third-party candidate. If no candidate on the voter's ballot matches his Proposition X opinion, the voter will vote for his party. Winning candidates C and F both oppose Proposition X. No winner of either primary favors Proposition X. 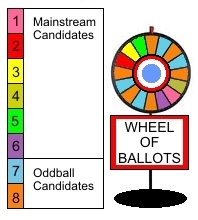 Operated this way, the primary election selects the oddball candidate - the candidate most different from the rest. An effort to defeat candidate C or candidate F will fail because the votes against them will be split. Candidate G enters the race after the primary. No candidate still in the race favors Proposition X. Winning candidate F opposes Proposition X. Though more primary votes were cast for Republicans, a Democrat wins the race. A candidate entering the race changed the outcome. There is no primary election with Independent Voting. People use this decision matrix to decide how to vote in this independent voting election. In this case, Independents consider the Republican party compatible and the Democrat party incompatible. In this case, half of the Republicans consider the Independent party compatible and half consider it incompatible. In this case, Democrats do not consider the Independent party compatible. In this case, Democrats do not consider the Republican party compatible. In this case, Republicans do not consider the Democrat party compatible. Winning candidate A favors Proposition X. A candidate entering the race cannot change the outcome unless he wins. The result always pleases the largest number of voters. In the table above, the number pleased for a candidate is his YES votes plus half of his ABSTAIN votes.